How did I get to be a tall man who is afraid of heights? I often wonder how many of us are out there, people struggling with a problem they don’t feel they can tell anyone else about for fear of being ridiculed. That’s like saying I’m a black man who is afraid of walking through the hood. It’s just ludicrous, and yet it’s so very true. And my children have absolutely no fear when it comes to being up high and looking down low (Don’t make me look down!). So they gravitate toward those kinds of activities when we’re out and about, particularly at amusement parks where there are things like huge water slides, and … the Ferris Wheel. Ah yes, the Ferris Wheel, a ride that should be calm, right? But it goes up into the air, and sometimes it stops while I’m at the top. Uh oh. The first time I rode the ski lift was when I was in fifth grade, and it starts off just fine, only inches from the ground. No problem. But as the thing went up the mountain the distance between it and the ground grew exponentially, until I became afraid to even look down for fear I would slip out from under the bar and crash to a bloody death. Yes, my imagination is just that vivid, and it was even back in fifth grade. I vowed never to go on that horrendous contraption again, even if it meant hiking up the mountain in those godawful heavy boots. Well, the Ferris Wheel makes me feel the exact same way. At first it seems really natural, as easy as training wheels, but then it hitches and rises a notch, then hitches and rises another. Before I know it I’m suspended high up in the air with nothing but space between me and the ground. And the worst part — I have absolutely no idea how long I’m going to be up there, and when I’ll ever be free to touch the blessed ground again. 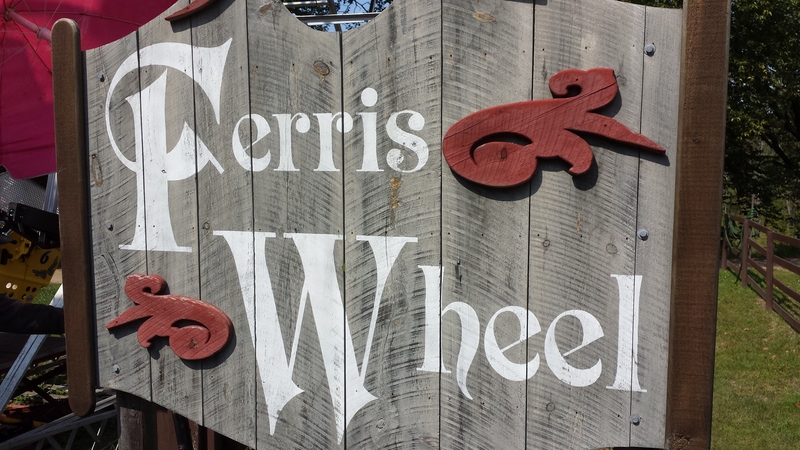 So, two weeks ago we went to the Enchanted Forest, where they have, among other rides, a Ferris Wheel with an old-timey sign and a sense of nostalgia. It also goes pretty high in the air, and I find myself cocking my head to look way up at it. I’d rather look way up at it than way down from it. You could pay me to be the guy at the bottom who lets people off and on, and I would be a happy camper, but it doesn’t work that way. Because Lexi wanted to ride it, and my wife was nowhere in sight. And up we went. Somehow I survived, and 10 minutes later I was back on land again, a little worse for the experience, but looking at the smile on Lexi’s face made it all worthwhile. I took a picture of the sign before we got on. I figured it would be easier than when I was all wobbly after. Is it ski time yet?